The worst part of the cancer treatment is coming in the next two weeks and yes, I am not looking forward to it. Radiation burn and the effects do not sound like fun. But with God, and the prayers of the saints, I will make it through. God has been good and I have not been depressed so far. I thought I would be since I tend to be a melancholy person; poets are like that I think. And I call myself a poet after more than 4,000 poems written – good and bad, heavy on the later. Not saying I won’t get down at some point. I look at David who wrote Psalm and he certainly had his gloomy moments. I’ve been marking verses just in case I need them, like “Be not far from me, Oh God; come quickly, O my God, to help me.” Ps 71:12, and “I am in pain and distress; may your salvation, O God, protect me.” Ps 69:29. When my pleas seem to fail I will fall back on His love. “The Lord is my strength and my song; he has become my salvation.” Psalm 118:14 “Whoever is wise, let him heed these things, and consider the great love of the Lord. Ps 107:43. 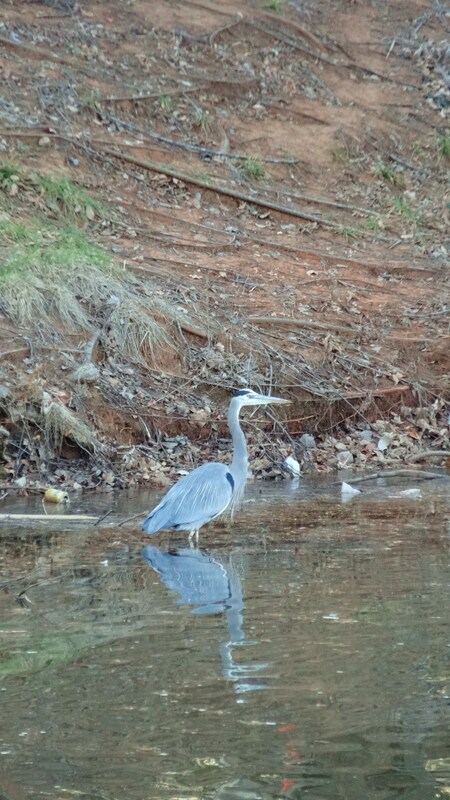 A blue crane, an endangered species, landed on the pond in my back yard last week. In East Asia culture, a blue crane symbolizes longevity. With my foggy brain, I wondered if I imagined the bird so I took a picture. Let me know if I’m mistaken on the identity of this visitor, but it stayed for an extended afternoon visit. What a nice surprise. I watched the crane, calm and collected amidst the chaos of geese, ducks, and squirrels. May my heart be like that. Though bored and uncomfortable, no matter what goes on around me, may I be peaceful and unruffled. I am so happy for what I consider to be good news, even though you are going through some rough times. It is good to see how God is using this time in your life to mold you into what he wants you to be, and to get you ready for what he has planned for you to serve him the rest of your life. May God surprise you with the gift of no suffering during the last phase of your treatment. May I take you out to lunch sometime soon? Bless you, Kathryn… My prayers are still with you and will continue to be. Keep up with the updates and know that God IS with you and will be glorified through the whole ordeal – if you will let Him. I know you will. You are a jewel! Kathryn, I’ve read about chemo brain, but I wonder if it’s more an emotional issue related to a cancer diagnosis because I swear I have all the symptoms. And, as you know, I am not taking chemo. Maybe we are simply distracted by the fact that we are under attack by a potential killer. How can we focus on cleaning house and reading books when our bodies are in a battle for our lives? You could be right. I have no idea. THank you Karen, there are few people in my childhood as close as you and your family. Hope all is well with you!